Steve Martin returns to the scene of the fun as the brilliant, bumbling Inspector Jacques Clouseau in this side-splitting slapstick comedy for the whole family! When legendary treasures from around the world are stolen, including the priceless Pink Panther diamond, Clouseau is assigned to a dream team of international detectives who are under pressure to bring the master thief to justice before he strikes again. Co-starring Jean Reno, Alfred Molina, Andy Garcia, Lily Tomlin and John Cleese, The Pink Panther 2 will steal your heart ... and keep you laughing! $11.588 million on 3243 screens. 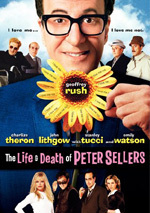 While I don’t know if anyone clamored for a relaunch of the Pink Panther films without Peter Sellers, the 2006 flick with Steve Martin found a decent audience. No, its $82 million gross didn’t light the box office on fire, but it demonstrated that crowds still liked Inspector Clouseau, even without the character’s most popular interpreter. That box office take also meant a sequel became inevitable – and we got that sequel in early 2009. In The Pink Panther 2, a master thief named The Tornado steals a variety of priceless treasures like the Magna Carta. 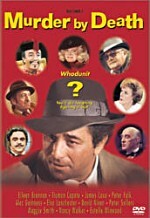 Inspector Clouseau (Martin) wants to stay in France to protect the Pink Panther diamond, but he receives the order to go to Japan and participate in a “Dream Team” of detectives. Before Clouseau can leave, however, the Tornado steals the Panther. This means Clouseau remains in France and the Team comes to him. They dig into the investigation while a romantic subplot bubbles. At the end of the first film, Clouseau and his assistant Nicole (Emily Mortimer) discreetly launched a romance, but they remain reluctant to acknowledge it. Clouseau becomes threatened when fellow investigator Vicenzo (Andy Garcia) takes an interest in Nicole. If you search this site, you’ll not find a review for the 2006 Pink Panther. I saw the movie theatrically and simply felt no desire to watch it again when it hit DVD. Granted, I do often dig into popular movies I disliked because I think the site “requires” their review, but the Panther remake just wasn’t successful enough to become a “must have” for the site. Maybe scores of people abandoned us because I never wrote up that flick, but I kind of doubt it. Given my lack of affection for the 2006 film, I didn’t bother with Panther 2 during its theatrical run. Unlike a movie ticket, the Blu-ray cost me nothing, so I figured I’d give it a look. Perhaps it’d impress me more than the mediocre, forgettable 2006 flick. Or perhaps not. Honestly, I barely remember the 2006 movie, so I find it hard to directly compare the two. That said, I can’t imagine Panther 2 outdoes its predecessor, as it offers an experience so forgettable that I seriously doubt I’ll recall anything about it a week from now. Back in 2006, I thought Martin was the wrong man to play Clouseau, and I’ve not changed that attitude over the last three years. Anyone would find it tough to fill the shoes of Peter Sellers; he was an extraordinarily gifted mimic and physical comedian who could really lose himself in a variety of parts. Performers like that don’t come along every day. I think Martin is a great talent himself, but his skills don’t lend themselves to the physical comedy on display here. Really, someone like Jim Carrey would seem like a much better fit for the part; he’d fit better with the film’s cartoony absurdity and prove more pliable as a physical comedian. Martin feels too much like a square peg shoved into a round hole; he’s a fine comedian but not right for this part. Panther 2 boasts a stunning supporting cast, and that makes its many inadequacies all the more apparent. In addition to Mortimer and Garcia, we find Jean Reno, Jeremy Irons, John Cleese, Alfred Molina, Lily Tomlin and Aishwarya Rai Bachchan. That’s a dynamic list of actors, none of whom can even remotely redeem this misbegotten comedic adventure. Like the Sellers flicks, the story of Panther 2 remains completely subservient to its slapstick set pieces. That doesn’t bother me much, as I don’t expect a tight narrative from this kind of movie. However, I would like to get some cleverness and laughs from the material. These never result. I might’ve chuckled twice during the movie, and that’s a poor return on a 90-minute investment, especially given the strong cast. How can a film with Martin, Cleese and Tomlin produce only a couple of minor titters? That’ll remain a mystery, I guess. At no point does Panther 2 become an unpleasant experience, but that’s not exactly a high recommendation. We deserve a whole lot more than “it wasn’t painful” from a crew like this. 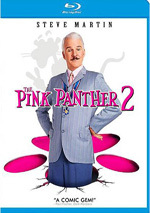 The Pink Panther 2 appears in an aspect ratio of approximately 1.85:1 on this Blu-ray Disc. At all times, this was a stellar transfer. Sharpness excelled. The movie always looked concise and accurate, without a hint of softness on display. No issues with jagged edges or shimmering occurred, and I saw no signs of edge enhancement. Source flaws also were absent, as I witnessed no specks, marks or other defects. Colors fared very well. The movie featured a warm natural palette that delivered some sumptuous hues. The tones showed terrific vivacity and looked great. Blacks were dark and firm, while shadows showed nice smoothness and clarity. This was a simply terrific image. Expect a pretty standard comedy mix from the DTS-HD MA 5.1 soundtrack of Panther 2. The flick failed to demonstrate a lot of activity despite a few action scenes. A segment in which Clouseau fell through some fireplaces used the spectrum well, and music boasted solid stereo presence. Otherwise, the track focused on general ambience and little more. At least audio quality seemed strong. Music worked best, as the score appeared lively and dynamic. Effects also showed good range and clarity, though they rarely did much to establish themselves in a prominent manner. Speech was concise and crisp. Overall, this was a decent track but not anything memorable. When we head to the set’s extras, we start with a Gag Reel. It lasts three minutes, 33 seconds as it shows a predictable mix of mistakes and giggles. Not much of interest results. Two featurettes follow. Drama Is Easy… Comedy Is Dangerous goes for seven minutes, 43 seconds and features notes from director Harald Zwart, executive producer Ira Shuman, producer Robert Simonds, 2nd unit director/stunt coordinator Ernie Orsatti, stunt double Courtney Kaitlin, and actors Steve Martin, John Cleese, Armel Bellec, and Jack Metzger. “Dangerous” looks at stunts and the film’s physical comedy. The comments from the participants don’t add a ton of strong details, but the footage from the set gives us some nice glimpses of the shoot. A Dream Team Like No Other runs 13 minutes, 56 seconds and includes Martin, Zwart, Simonds, Shuman, Cleese, dialect coach Jessica Drake, and actors Jean Reno, Andy Garcia, Alfred Molina, Emily Mortimer, Lily Tomlin, Yuki Matsuzaki and Aishwarya Rai Bachchan. “Team” concentrates on the cast, characters and performances. Expect a lot of happy talk here, as we get a great deal of praise for the participants but not much else. A game called Master Thief - Global Crime Showdown! comes next. This sends you on a mission to steal the Pink Panther diamond. It involves trivia questions about various world locations; get three “artifacts” and you can try to steal the Panther. The questions are quite easy most of the time, so don’t expect much of a challenge. Overall, “Thief” is more annoying than it is fun. The package’s most significant supplements appear on Disc Two. There’ll you find a DVD with 27 Pink Panther shorts. We get “The Pink Phink” (1964), “Pink Pajamas” (1964), “We Give Pink Stamps” (1965), “Dial ‘P’ for Pink” (1965), “Sink Pink” (1965), “Pickled Pink” (1965), “Pinkfinger” (1965), “Shocking Pink” (1965), “Pink Ice” (1965), “The Pink Tail Fly” (1965), “Pink Panzer” (1965), “An Ounce of Pink” (1965), “Reel Pink” (1965), “Bully for Pink” (1965), “Pink Punch” (1966), “Pink Pistons” (1966), “Vitamin Pink” (1966), “The Pink Blueprint” (1966), “Pink, Plunk, Plink” (1966), “Smile Pretty, Say Pink” (1966), “Pink-A-Boo” (1966), “Genie with the Light Pink Fur” (1966), “Super Pink” (1966), “Rock-A-Bye Pinky” (1966), “Pinknic” (1966), “Pink Panic” (1966), and “Pink Posies” (1967). All together, these 27 shorts fill a total of two hours, 51 minutes and 28 seconds. This disc represents a previously released set from 2006 called The Pink Panther Classic Cartoon Collection Vol. 1. If you already own that disc, this one becomes redundant, but if not, it contributes real value to the package. The shorts vary in quality but prove to be reasonably entertaining; to be sure, they’re vastly superior to the dreadful Panther 2. Finally, a third disc provides a Digital Copy of the film. This allows you to easily transfer the flick to your computer or portable viewing device. It doesn’t do anything for me, but your mileage may vary, as they say. A few ads open Disc One. We get promos for digital copies and Fame. No trailer for Panther 2 appears here. And no entertainment shows up here, either. The Pink Panther 2 totally squanders an excellent cast with its inane slapstick shenanigans. At best you might chuckle a couple of times, but you’ll find no greater amusement than that. The Blu-ray provides excellent visuals, acceptable to good audio, and a set of supplements bolstered by almost three hours of cartoons. Those shorts give us the only enjoyment in this package, as the main feature is a depressing dud.